Unlike its tropical neighbor, the Caribbean, the Gulf of Mexico is not known as a prime diving site. Most divers shun its unpredictable weather, its poor visibility, and its dead zones. Diving in the Gulf brings to thought images of oil rigs, pollution, algae overgrowth. And it’s true that these environmental threats persist throughout the region, but they have yet to dampen the amazing array of marine biodiversity found throughout its waters. I have discussed the Flower Garden Banks National Marine Sanctuary at length in my previous entries, so I would like to highlight some local diving sites that promise adventure and an impressive array of life to those who visit. During the summer, I visited the Saint Pete Artificial Reef twice with Blue Water Explorers and the Canterbury Venture Crew. The purpose of our trips was to document the different types of species and habitat we observed at the site. Saint Pete Artificial Reef is an expansive site that includes a handful of military tanks, a barge, and other rubble and pilings. On a good day, divers will encounter goliath grouper and schools of fish. Unfortunately for us, the aftermath of Tropical Storm Debbie was lingering. The entire month after the tropical storm, which stayed in the Saint Petersburg area for several days, visibility throughout the area in dive sites shallower than 40 feet was dramatically reduced. Despite the challenging conditions, the entire group found an interesting array of life amongst the rubble, the tanks, and even in the sandy areas. 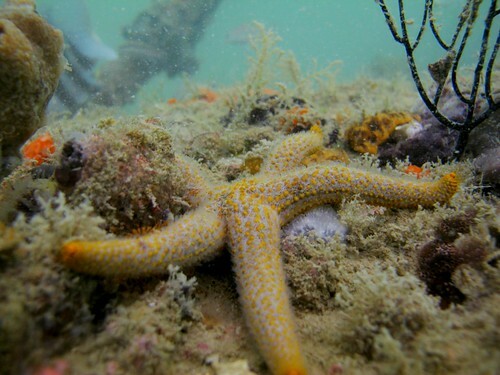 Starfish and black urchins, both a type of echinoderm, covered the site, serving as indicators of a healthy marine environment. 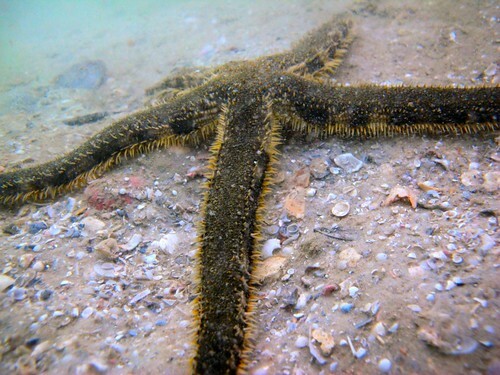 Starfish function through an internal hydraulic water vascular system, which aids in movement and capture of prey. However, this system pumps un-filtered water throughout the starfish’s body, making the creature vulnerable to water pollution. Despite their seemingly sedentary state, starfish are actually voracious predators that can have a major impact on the benthic community. They primarily feed on mollusks, using their powerful limbs to force open the shells of clams and oysters. This large starfish, over a foot in width from the tip of one leg to the other, could be seen moving relatively quickly across the benthic floor. It appears that the bristles extending from each leg assisted in its speedy locomotion. I observed this starfish in two different sites along the Gulf coast of Florida, but have yet to discover its exact species name. Fragile corals and sea whips decorated the site, adding to the colorful display of sponges and fishes. 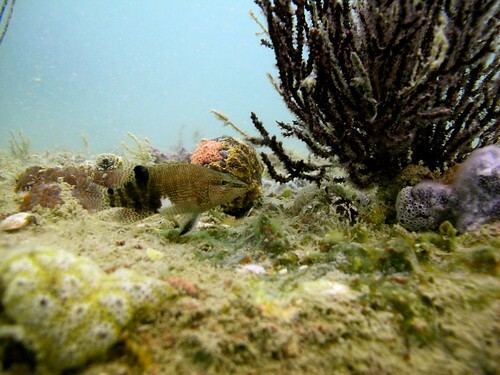 The most abundant and curious creatures appeared to be these small hawkfish. Based on their appearance, they seem related to the Redspotted Hawkfish (Amblycirrhitus pinos). Hanging suspended, one finger gently placed on a rock and the other hand gripping my camera, these fish would quickly approach me… sometimes even nipping my finger! Despite their curiosity, their quick movements allowed them to evade most of my photographs. 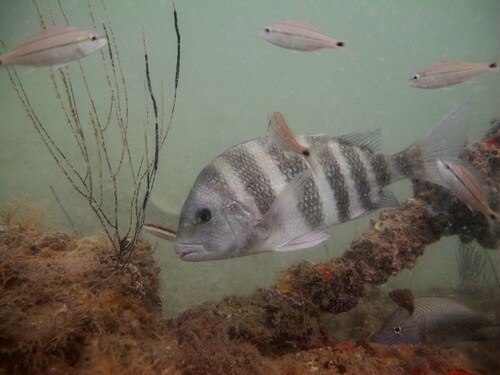 As I waited, perched on a piece of the wreckage that formed the base of the reef, a Sheepshead (Archosargus probatocephalus) swam by, grazing on the benthos covering the site. Sheepshead are a popular target for recreational fishermen, but there is currently no management strategy in place to monitor their population. Most of the above photographs were taken during our second trip to the Saint Pete Artificial Reef, on July 25. Although visibility was poor, we were able to see a variety of life through a concerted and thoughtful effort to look at the small nooks and crannies of the reef and the edges of the structure. During our first dive trip to the site, on July 13, visibility was significantly reduced, being a mere two to three weeks after Tropical Storm Debbie. At this time, it was late in the summer, which meant warmer water and subsequent signs of coral bleaching on the hard corals at the site. Compared to the previous photographs, the water in the above image is a darker green. Using my flash due to the lack of light, I created backscatter in the top portion of the photograph, highlighting the density of particles in the water. 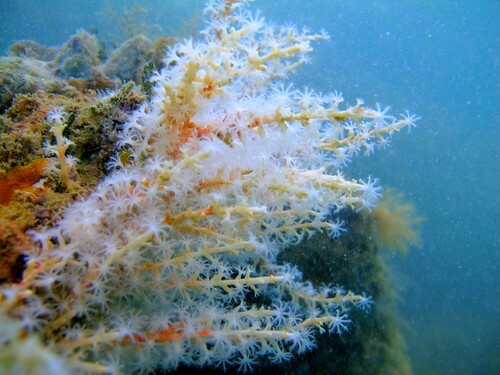 Warming ocean waters are also associated with increased algae production and growth, which may overgrow sites that lack the grazing herbivores to control it. 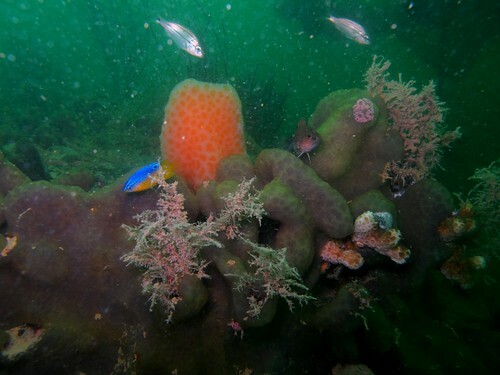 Nonetheless, this site still appears relatively healthy, with an abundance of encrusting and other types of sponges covering the site and tropical fish swimming all around.